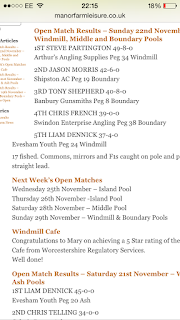 Sunday 22nd November - Manor Farm open, peg 24 windmill (FLYER!!!) 17 fished. Well where to start! This is a very good peg but has had no form of late so kept an open mind. There's an island to the right slightly easily reachable with 13-14.5m of pole so this was my main attack but kitted up some open water rigs to. Started off dobbing bread first 10 minutes without a bite! So went into open water and started catching steadily, leaving my island line with the intention of it being solid late! Had an instant response after going on the deck in open water but it started to fade after 1 hour 30 so had a look on the island and had 3 stockie F1s in as many put Ins then nothing! Caught the bulk of my fish at 13m in open water feeding and fishing pellets. Not sure about the island line??? It just didn't produce and fish were to small! 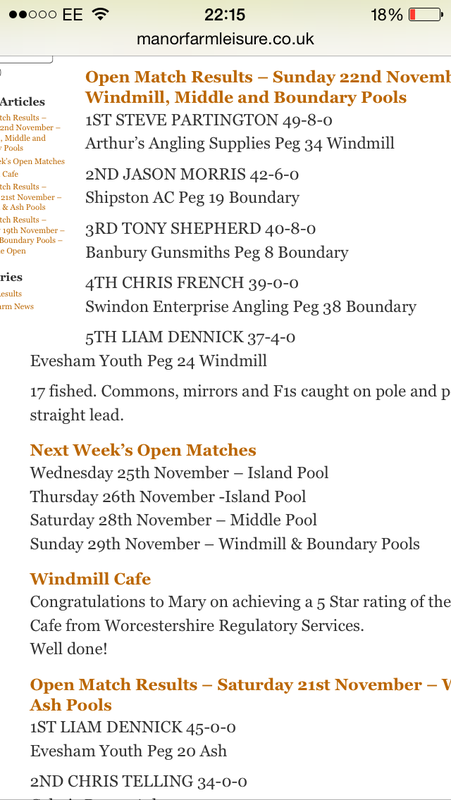 At the all out I had around 27/28 fish for 37-4-0 for 5th in the match and a lake win by default so picked up some money. It was a very strange day though, tried to catch a bigger stamp fish but didn't want to give it to much bait and didn't want to get to focused against the island. Still really enjoyed the day and roll on next weekend!